Moe Lane » Pride and Prejudice… and Zombies. Pride and Prejudice… and Zombies. Pride and Prejudice and Zombies is a real book, and it’s coming out in April, whereupon I will buy it. They’re making the argument that the original book is actually quite amenable to being updated with zombies added, which makes perfect sense to me: everything is better with zombies added, after all. The absolutely best part? They’re talking movie scripts right now. IT is a truth commercially acknowledged that Jane Austen’s high-spirited heroines can be recast as Hollywood brats or Bollywood sirens, wittily navigating the eternal perils of class, romance and unworthy men. Few challenges, however, are as unusual as the latest foe facing Elizabeth Bennet of Pride and Prejudice – a plague of the undead sent to reduce the picturesque villages of Longbourn and Meryton to smouldering ruins. 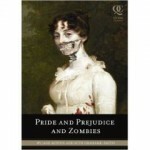 Hollywood studios are bidding to turn a radical reworking of Austen’s most popular book, now called Pride and Prejudice and Zombies, a parody to be published in April, into a blockbuster movie. Via I Watch Stuff, which apparently simply does not understand the glory that is this movie concept. If this film gets off of the ground, I will be there. Miss Elizabeth Bennett, with an axe, in the drawing room. I keep wanting to cry, but laugh instead. I can resist the film- no one will equal the Mr. Darcy in my head; but the book, I think I must have the book. Love it!